Nourish your hands with the Mandarin and Cedarwood fragranced Mineral Hand Cream from AHAVA. 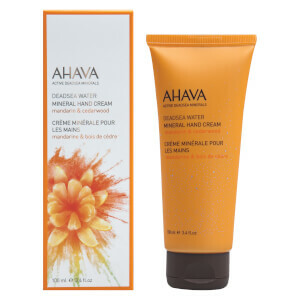 The luxurious hand cream is blended with skin-replenishing minerals and an aromatic combination of Mandarin and Cedarwood. The hydrating formula gently and effectively softens rough skin, leaving hands feeling nourished. Aqua (Mineral Spring Water), Ethylhexyl Palmitate, Cetearyl Alcohol, Cetyl Alcohol, Glycerin, Ceteareth-30, Sodium Cetearyl Sulfate, Propanediol (Corn derived Glycol), Hamamelis Virginiana (Witch Hazel) Water, Phenoxyethanol, Ethylhexylglycerin, Maris Aqua (Dead Sea Water), Dimethicone, Parfum (Fragrance), Allantoin, Butylphenyl Methylpropional, Linalool, Limonene, Hydroxycitronellal, Citronellol.